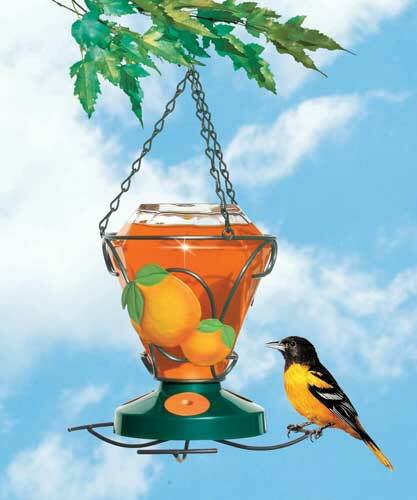 A perfect feeder for the beautiful Oriole, this sparkling work of art depicts a sunny orange motif that's sure to delight! 24-ounce Gem-Cut glass bottle with decorative wire, basket and chain. Three decorative orange slice ports allow feeding access. Dimensions:6.19" x 6.21" x 9.1" tall. 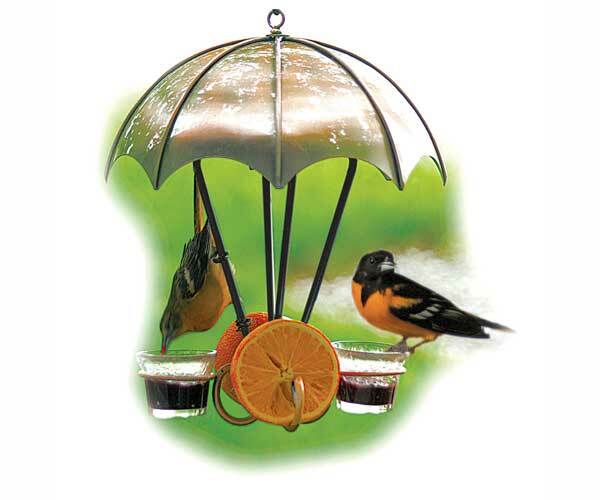 This beautiful brushed copper feeder is the perfect way to serve your Orioles fruit and jelly, it makes the food easily accessible to the birds and the birds accessible for viewing! Metal spikes on feeder hold oranges in place. 2 jelly dishes - also holds 2 orange halves. Dimensions: 10.5" Dia. x 14" tall.